You are here: Home / Sir Jason Winters Blog / Why Are Sir Jason Winters’ Books A Must-Read This Summer? Why Are Sir Jason Winters’ Books A Must-Read This Summer? Sir Jason Winters is a man of many talents. Not only did he come up with the formula for a tea that helped him overcome terminal cancer, but he has also authored several books to share his valuable knowledge with the rest of the world. These books range from autobiographical to his travels searching for secret ancient remedies that have been hidden from the world. The following books by Sir Jason Winters offer the insights and wisdom of a man who has dedicated his life to helping others. Getting the news that you have cancer can be one of the most devastating things a doctor can tell you. 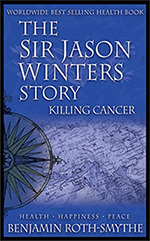 Sir Jason Winters found out that he didn’t just have cancer, he had terminal cancer. The doctors didn’t expect him to live more than three months. Instead of giving up and accepting his fate, Sir Jason Winters embarked on the most important quest of his life. Literally. He was determined to find a natural remedy that could help him beat this deadly disease. This book sets the stage for the rest of Sir Jason Winters’ life. Here, he details his cancer diagnosis and the journey it took him on. He talks about finding the different herbs for his tea, what makes those herbs so special and his remission from his illness. He also offers tips for people to apply so they can live longer and healthier. 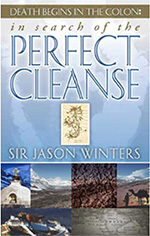 Not one to remain idle for long, Sir Jason Winters wrote his second book. This takes the readers from the glitzy lights of Las Vegas to the secluded mountains of Tibet, the tropical sun of the Bahamas and several other places as he continues his search for knowledge about ancient health remedies and how legends from the past can help ease whatever ails people today. This book provides readers with an easy-to-understand guide to ancient remedies that will help cleanse everything from the colon to the mind. This book tells readers about the healing properties of Melaleuca oil. Melaleuca oil, also known as tea tree oil, is found in certain parts of Australia. It is widely used as in different topical ointments and salves because it can help heal conditions such as acne, dandruff and even lice. This is the one book not written by Sir Jason Winters, rather, it’s written by his son, Sir Raymond Winters. Sir Raymond takes the reader on an action-packed adventure that was his father’s life. The book begins during the tumultuous post-World War 2 era in England and describes in vivid detail a trip down 1,000 miles on the MacKenzie River in a canoe. The reader also gets to ride along as Sir Jason Winters tries to become the first Canadian to cross the Atlantic Ocean by a balloon. While those two stories could fill several adventure novels, the story doesn’t end there. Sir Jason Winters also worked as a human crash test dummy by literally crashing cars into brick walls to test seat belts. But despite all those adventures and tales, Sir Jason Winters faced his greatest challenge at the age of 46 when he was diagnosed with terminal cancer and when he began his journey to find a way to beat the disease. All these books are not only education, but they’re also inspirational. Sir Jason Winters overcame many odds and defied death many times – it’s impossible not to be inspired by him. 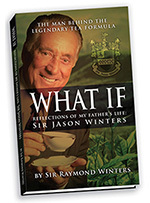 Find out for yourself why Sir Jason Winters has been an inspiration to all who read about him and the adventures that lead to his many world renowned teas and products. You can find all his books on our online store. https://sirjasonwinters.com/wp-content/uploads/2016/06/books.jpg 521 1030 Michael Austin https://sirjasonwinters.com/wp-content/uploads/2016/04/logo.png Michael Austin2016-06-28 10:18:302018-10-17 13:31:36Why Are Sir Jason Winters’ Books A Must-Read This Summer? Why Vitamin C Is So Healthy and Other Common Questions Is Your Body Getting Enough Vitamin D3 To Stay Healthy?